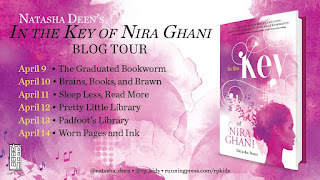 I am proud to share with you today's stop on the In the Key of Nira Ghani Blog Tour, hosted by HBG Canada. I read this one last month, and it surprised me how much I enjoyed it. 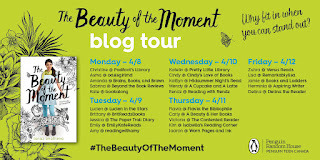 I am proud to share with you today's stop on the Beauty of the Moment Blog Tour, hosted by Penguin Teen Canada. I read this one last month, and it truly surprised me how much I enjoyed it. Once & Future is a gender-swapped retelling of King Author - oh, and it is set IN SPACE. This fast paced plot follows Ari, the newest incarnation of King Author, and Merlin, the great wizard who has aged backwards and now is a scrawny teenager. With a round table of diverse characters and the entire galaxy at stake, it's now or never for this misfit band of knights. Ari was a great character to follow, and I liked her development throughout the novel. I am very impressed with the diversity represented in the novel and how natural it felt. That was one of my favourite parts of the novel, it was well written and it is significant in today's society to have books with different gender identities and sexuality represented. 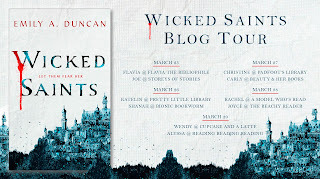 I am proud to share with you today's Blog Author Feature: Nicki Pau Preto, hosted by Simon & Schuster Canada. I am currently reading this one, and it is really surprising me. Nicki is Canadian YA author, living near Toronto, Ontario. With a degree in visual arts, a masters in art history, as well as a diploma in graphic design, she is passionate about art and the wonders of escaping the real world. She is not a fan of 9-5 work days, so thankfully her chosen career covers all those aspects. Crown of Feathers is her debut novel. This morning I am sharing my review for Bloodspell by C.J. Redwine, which releases tomorrow. I was so surprised by how much this magical world drew me in, just loved it! cters must be careful to keep those they love, and themselves, alive. Good morning friends! Here are my most recent reads, all Winter/Spring 2019 ARCs from amazing publishers! This novel follows Annie Tripp, a teenage girl who has everything she needs: designer clothes, elite figure skating lessons, and more. However, her precious world shatters when her father is accused of scamming hundreds of clients and investors. Temporarily living with her Aunt and Uncle is better than she expected, but soon family secrets start unraveling. Annie must focus on the truth, and which lies are better left alone.